Two days before leaving for Europe on a concert tour of Madrid, Lisbon and Rome, piano virtuoso Xiaofeng Wu honors our hospital and university community with a solo performance in the Main Lobby of UH. 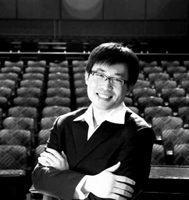 Among his many successes, U-M alum Dr. Wu won the Gold Medal at the 10th Guerrero Foundation International Piano Competition in Madrid and First Prize at the 82nd Society of American Musicians Piano Competition in Chicago. Most recently, Wu was top laureate at the Russian Music International Piano Competition and at the Jose Iturbi International Music Competition in Los Angeles. For this return performance at UH, Wu has included pieces by Spanish and Chinese contemporary composers. The scope of jazz for the Edie Herrold Trio is wide and broad. In the realm of American jazz, the styles they perform range from standards to modern. But that’s not all; this trio also hits many other compass points of jazz, most appreciably the land of Brazil. When band leader and bassist Edie Herrold is joined by Dale Grisa on piano and Dennis Sheridan on percussion, you can expect to hear intricate, intriguing and animated original pieces as well as American jazz standards, leading works by Brazilian composers and even a few jazz renditions of popular tunes. Joe Scott and Hannah Alkire have combined their musical talents to create Acoustic Eidolon's unique sound, incorporating a rich blend of musical influences, including Celtic, contemporary, bluegrass and Latin music. As they perform throughout North America and Europe, Scott plays an instrument he invented: the double-neck guitjo, a custom acoustic guitar with two necks. This one-of-a-kind instrument has incredible range and tonal qualities, sounding at times like a piano, dulcimer or beautiful harp. Combine that with Hannah Alkire’s stunning tone and impeccable cello-playing, and you have an exciting new acoustic instrumental sound. In addition, their concerts are peppered with internationally influenced vocal selections.